Located a half a mile from the Biltmore Estate just up the road from their South Slope Specialty Brewery, Hi-Wire Brewing opened the 27,000 square foot Big Top Taproom & Production Brewery in the summer of 2015. The Big Top brings the brewing process to life by giving craft beer drinkers the opportunity to enjoy a pint of Hi-Wire’s approachable and balanced lagers and ales beside the tanks where they were created. This large, industrial-feeling space features a bier garden, a permanent Foothills Local Meats food truck serving the best in local, pasture-raised meats with vegetarian options available, and is home to all of Hi-Wire’s large events. Book a tour! Inquire about renting this space here. 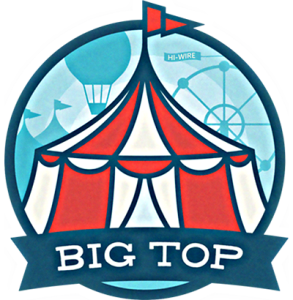 PARKING: We’re very pleased to offer a limited amount of on-site parking at Big Top. However, when our lot fills up we ask that you please not park in any of our neighbor’s lots. This includes Appalachian Vintner, Standard Pizza, Village Antiques, and Biltmore Fitness. Please see our overflow parking map below for some walkable lots in the area. Thanks!